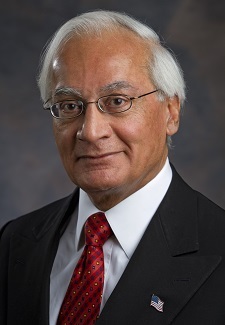 Dr. Kalsi gives the spring 2016 convocation address at the University of Houston Cullen College of Engineering - Kalsi Engineering, Inc.
Dr. M.S. 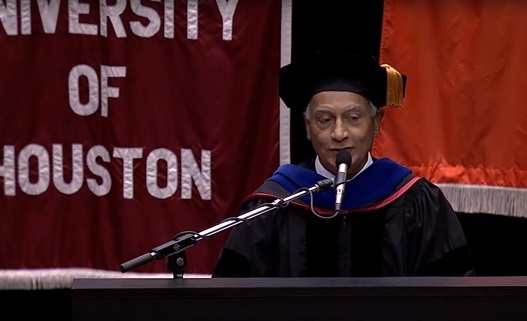 Kalsi, President of Kalsi Engineering, was the convocation speaker at the May 13, 2016 spring convocation ceremony of the University of Houston Cullen College of Engineering. To see a video of the event, click here. The introduction begins on the video at 33:10, and Dr. Kalsi’s convocation address begins at 35:57. Dr. Kalsi was introduced by Dr. Hanadi Rifai as the Chairman of the Mechanical Engineering Industrial Advisory Board, and a member of the Engineering Leadership Board of the Cullen College of Engineering. Dr. Rifai also stated that Dr. Kalsi and his wife, Marie-Luise Schubert Kalsi, recently established an endowed professorship at the University of Houston in honor of Professor Gabriel Fazekas, and have made donations to numerous scholarships supporting graduate and undergraduate engineering students over the years. She also mentioned Dr. Kalsi’s graduate studies at the University of Houston, his business firm Kalsi Engineering, and that firm’s involvement in valve and rotary seal technology. Dr. Kalsi was beaming when he began his convocation speech, because he missed his own University of Houston convocations due to travel commitments, and now finally had a chance to participate. 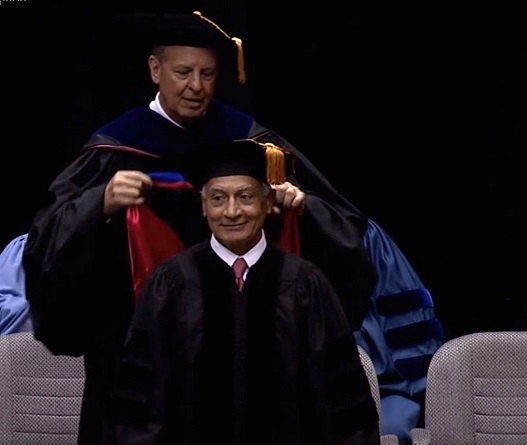 Later in the ceremony, during the recognition of the PhD graduates, Dr. Kalsi was recognized as an honorary member of the class of 2016 for his academic work at the university (MSME ’70, PhD ME ’75), and was formally hooded by Dr. Tedesco as a PhD. This part of the ceremony begins in the video at 1:03:50. Dr. Kalsi began his speech by congratulating the newly minted engineers who were graduating, and recognizing the families who worked hard to support the educational endeavors of the graduates, helping to make the realization of their dreams possible. He mentioned that many of the students were the first college graduates in their families, and said that the convocation was an important occasion for graduates to recognize the sacrifices and contributions their families have made for them, and referred to the graduating students as the pride and joy of their families. After identifying his wife in the audience, Dr. Kalsi went on to say that like the graduating students, he chose engineering as a career, and has found it to be a rewarding and fulfilling profession. He told them that they would go on now to design new devices, and improve others, and mentioned their contributions will not only benefit the companies they work for, but will benefit the public as well—and that it feels good to help to advance the state of the art. He indicated that the graduation milestone being celebrated was not only a recognition of the hard work the students had put in over the past four or five years, but was also the beginning of their new careers in the profession of engineering. In this profession, he told them, they had an excellent head start, because they had received a first class education from an engineering faculty that is second to none in the world. He was positive their education will serve them very well in their careers, giving them a very strong foundation to build upon. Dr. Kalsi then described how he came to the United States 42 years ago, “bright eyed, bushy tailed, and full of dreams.” He said that this is the country where he wanted to live because it is the most technically advanced in the world, but his future was uncertain—and now, years later, here he is with a new group of graduates who are going through the same feelings. He described how fortunate he felt to have a top-notch person like Professor Gabriel Fazekas as his advisor, just as the graduates now have excellent faculty members who have provided the technical foundation they need to move forward in their professional careers. In terms of advice to the graduates, Dr. Kalsi drew from his own life’s story to reveal the three things that turned out to be the ingredients to his own success. One ingredient was communication, a factor that many engineers don’t give much importance to. They think that if they have done good work, they will produce a good report, and that should be sufficient. Dr. Kalsi said that is not sufficient. Engineers have to take the time to be able to communicate clearly and succinctly in simple terms, to make their work accessible. He said that the effectiveness of each graduate will depend on how much they focus on communication skills. He made it clear that he wasn’t referring only to written skills, but verbal skills as well. He said that in order to be able to succeed in their professional careers, the graduates should now give as much attention to the development of their communication skills as they had just given to their engineering courses. The second item that Dr. Kalsi emphasized was hard work and perseverance, for which there are absolutely no substitutes. He said that the graduates will have to start out small, and take one step at a time, making sure they immerse themselves completely, so that they can really understand the discipline they chose to be a specialist in. He said that actually making a difference takes real effort, and if they want to make a difference, they will have to put in some extra effort over and beyond what may be required for their immediate job. The rewards come later, he said, because there is no such thing as instant gratification in a career. Instead, he said, the graduates will have to believe that their hard work, their communication skills, and the products they produce will eventually be recognized and rewarded. The third item that Dr. Kalsi mentioned is teamwork. He noted that some of the graduates are very brilliant — far smarter than their colleagues — and cautioned them that they should not let this become a deterrent to their overall success. He stated that if they don’t understand how to galvanize a team to work together, and thereby produce an overall effectiveness that will exceed their own effectiveness, then they really haven’t served themselves or their engineering team very well. He also said that by focusing on teamwork, they would develop leadership skills that would serve them well throughout their careers. Concluding his advice, Dr. Kalsi reiterated that these three ingredients were important to his own success, and he was certain that they would likewise be important to the success of the graduates, no matter what field they may ultimately choose. In closing, Dr. Kalsi said that an important ingredient that allows us to succeed is our remarkable country. He came to this country with no relatives, and no connections, and was able to succeed because America offers unlimited opportunity — something that immigrants recognize and continue to appreciate. Dr. Kalsi asked the graduates to please not take our freedom for granted. He stated that many of the graduates were born and raised here, and suggested that they try to look at their country from the perspective of an immigrant, to realize what beautiful opportunities the freedom of the United States provides. Dr. Kalsi, President, Kalsi Engineering, Inc.
Dr. Kalsi, delivering the spring 2016 convocation speech at the University of Houston Cullen College of Engineering. Dr. Kalsi, who missed his own convocation, is formally hooded by Dr. Tedesco for his 1975 PhD, as an honorary member of the class of 2016.